HMAS Kanimbla has joined Australia’s Operation Padang Assist to provide emergency humanitarian assistance to Indonesia. West Sumatra of Indonesia suffered two large earthquakes on September 30. Padang, with almost a million people on the coast of Sumatra, was paralyzed after a 7.6-magnitude earthquake toppled buildings and sparked fires. has sailed on October 03.
an Amphibious Landing Platform based at Sydney. to reach Padang in 10 days after embarking additional personnel, engineering equipment and infrastructure from Townsville and Darwin to provide humanitarian aid. has RAN’s Primary Care Reception Facility (PCRF) with a 40-bed hospital incorporating full surgical and recovery facilities and an embarked helicopter capability. 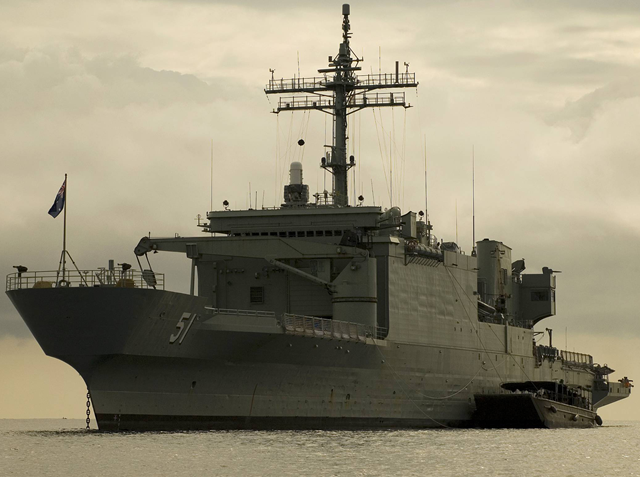 HMAS Kanimbla will provide all necessary assistance in close coordination with the Indonesian Government. View photographs and read more from DOD Australia. Above photograph of HMAS Kanimbla is from DOD Australia.